co-founder with John C. Dvorak of the scitech and geek culture site aNewDomain, Gina's now-legendary team includes some of the top writers, editors, photojournalists, techpros and artists in the world. Their mission is to reignite independent and ethical journalism in tech and other high-interest sectors. Paul Braren, who recently joined aNewDomain, told us he was always a huge fan of "Alfred Poor’s Computer Cures" columns in Computer Shopper. The two first met in 1992 at Cornell University at a Microsoft Flight Simulator conference. At the time, Braren was a teaching assistant with Cornell professor and world renowned sleep expert Jim Maas. But no one was sleeping at this event. 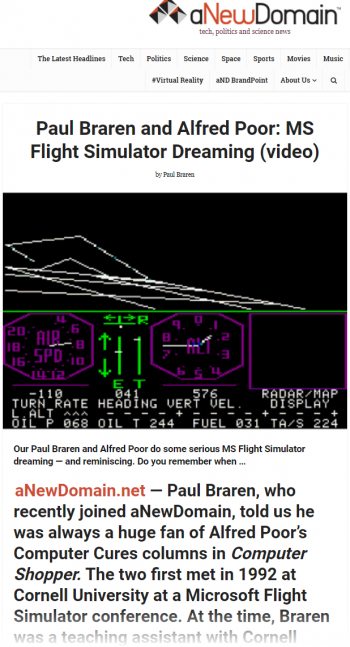 Back then, Microsoft Flight Simulator had everyone on the edge of their seat. Here’s Paul Braren with more. In case you're wondering, my TinkerTry.com is also continuing to grow, and I've got a dozen more exciting home lab projects in the hopper. It's just that you might occasionally bump into my posts elsewhere on the web as well.